The most straightforward free backing up tool, iFoneBackup is released today! iFoneBackup by Auntec is released today. Now you can back up your iPhone even if you don’t have iTunes installed or your iTunes does not work properly. Just one click, you can accomplish backing up your iPhone. Apple does provide iTunes as data managing software for your iOS devices. However, it frustrates most iDevice users because it is complicate and accident-prone. The newly released iFoneBackup backs up your iPhone data painlessly just with one click and steers clear of the risk of erasing data. To back up your iPhone with iFoneBackup, all what you need to do is to launch the application and connect your iPhone to your computer, click “Back Up Now” after your iPhone is recognized. iFoneBackup does lives up to its name as the most easy-to-use iPhone backing up tool. iFoneBackup is so easy-to-use that you can create in such a straightforward way. iTunes backup file is not readable and once it is damaged there is no way to get back your iPhone data. So you need additional backup of your iPhone data in case of accidental iTunes backup file corruption. The backup file created with iFoneBackup can also be restored through iTunes when your iTunes backup file is damaged or lost. Act as a perfect alternative to iTunes, iFoneBackup is much simpler. And you will be informed about the backup folder and path clearly after the backing up is finished. As iTunes has never been as reliable as it is supposed to be, creating multiple backups becomes necessary. 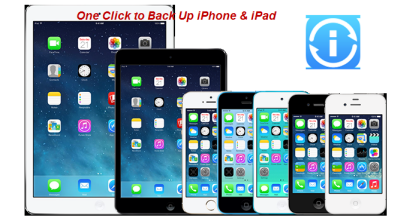 iFoneBackup therefore turns out to be a great choice to create backup for your iPhone, iPad and iPod Touch on your computer in the most straightforward way. With one single click, you can successfully create a backup on your computer to guard against accidental data loss or deletion as well as awkward performance of iTunes. iFoneBackup is completely free software and you won’t lose anything to have a try.